To the best of our knowledge, this paper presents the first analysis of the practices of a community of Twitter citizen reporters in a life-threatening environment over an extended period of time (10 months). We discover that in this community, anonymity and trustworthiness are coexisting. 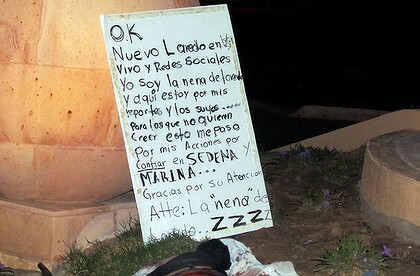 Because these citizens live in a city troubled by the narco-wars that have plagued Mexico since 2006, it is a great example of a community where anonymity of active participants is crucial, while lack of anonymity may be fatal. We describe a series of network and content based features that allow us to understand the nature of this community, as well as discover conflicts or changes in behavior. The large volume of user-generated content on the Social Web puts a high burden on the participants to evaluate the accuracy and quality of content. We usually rely on known reputed news sources (NPR, NYT, BBC, Der Spiegel, etc.) to evaluate them. However, not every country has a free press or is willing or able to allow the international press to move freely. In some countries, like Mexico, journalists have been killed by organized crime or put under pressure by the authorities to stop reporting on certain events. In the era of social Web, more citizens are reporting of newsworthy issues gaining reputation as citizens-reporters. However, not everywhere in the world is there a right to and protection of free speech. In countries where the traditional media cannot report the truth, anonymity becomes a necessity for citizens who want to exercise their right of free-speech in the service of their community. Is it possible for anonymous individuals to become influential and gain the trust of a community? Here, we discuss the case of a community of citizen reporters that use Twitter to communicate, located in a Mexican city plagued by the drug cartels fighting for control of territory. Our analysis shows that the most influential individuals inside the community were anonymous accounts. Neither the Mexican authorities, nor the drug cartels were happy about the real-time citizen reporting of crime or anti-crime operations in an open social network such as Twitter, and we discovered external pressures to this community and its influential players to change their reporting behavior. When we read news, we usually choose our information sources based on the reputation of the media organization. We trust the news organizations, therefore, we expect that their reporting is credible, though in the past there have been breaches of such trust, and all media organizations have an embedded bias that affects what they choose to report. Social media platforms specializing in organizing humanitarian response to disasters, such as Ushahidi, rely on people on the ground to report on situations that need immediate attention. Anyone can be a reporter. 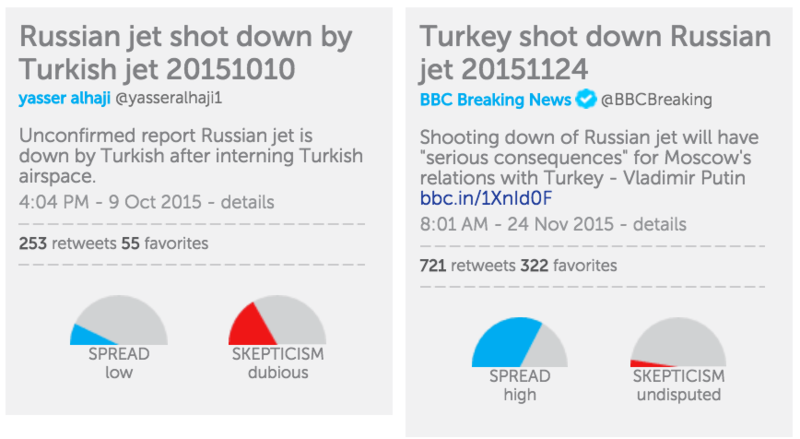 However, this poses a new problem: how do we assess the credibility of citizen reporting? Citizen reporting lacks the inherent structures that help us evaluate credibility as we do with traditional media reporting. But sometimes, citizen reporting might be the only source of information we might have. 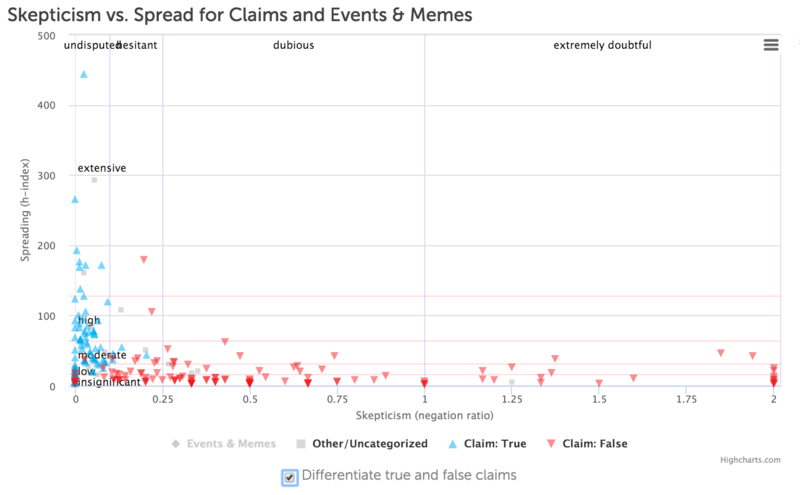 How can we use technology to help us verify the credibility of such reports? To address this question we look at a particular community of citizen reporters gathered around Twitter accounts in a Mexican city plagued by drug-related violence. Twitter has a unique feature that facilitates on-the-fly creation of communities: the hyperlinked hashtags. While previous research has shown that the majority of Twitter hashtags have a very short half-life span (Romero, Meeder, and Kleinberg 2011), in this paper we analyze the practices of a community of citizens that have been using the same hashtag since March 2010 to report events of danger happening in their city. We refer to the community with the obfuscated hashtag #ABC_city, which is a substitute for the hashtag present in the tweets of our corpus. We will also substitute the exact text of important tweets with a translation from Spanish to English, so that searching online or with the Twitter API will not lead to unique results. #YXZ_city #ABC I propose #ABC_city to inform about news and important events in our city. @Spammer101 Stop spamming #ABC_city. It’s only about important events that might affect our society. Between May and November 2010 the usage of the hashtag is sparse, with the old hashtags being used more often. An increase in the adoption of #ABC_city starts on November 4th, only a week before the starting period of the #ABC_city dataset. We used a basic dataset and a supplemental collection informed by our initial set of data. The original dataset consists of 258,734 tweets written by 29,671 unique Twitter users, covering 286 days in the time interval November 2010 – August 2011. On November 2010 we provided a set of keywords related to Mexico events to the archival service. The collection was later divided in separate datasets according to the presence of certain hashtags. To supplement our limited original dataset, we performed a series of additional data collection in September, 2011. In particular, we collected all social relations for the users in the current dataset, as well as their account information. 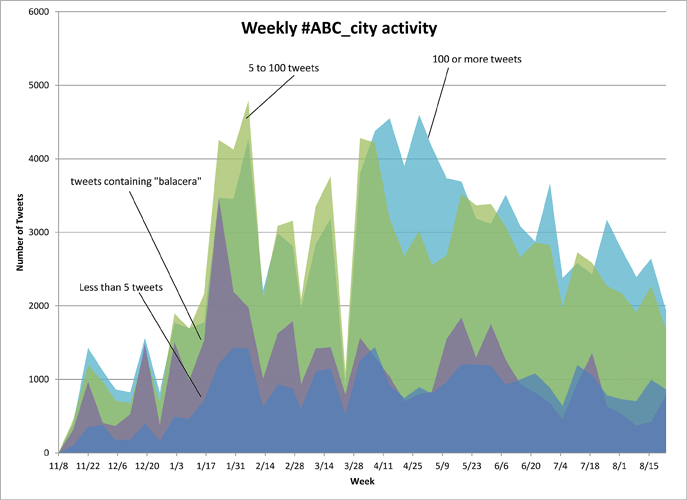 We collected all tweets for accounts created since 2009 with less than 3200 tweets, in order to discover the history of the (anonymized) hashtag #ABC_city that defines the community we are studying. We also made use of the dataset described in (O’Connor et al. 2010) to locate tweets archived in 2009. While we would prefer to give further details on the collected data and use them freely in this paper, on ethical grounds, we will protect this community under anonymity, due to potential risk that our research can pose now or in the future. To exemplify the seriousness of the situation, we provide one example out of the many documented in the press of what the lack of anonymity can lead to. Laredo Girl was the pseudonym used by the woman to participate in a local social network that enabled citizens to report criminal activities. Followee Relations Out of 29,671 unique users in the corpus, we were able to collect followee information for 24,973 accounts that were active and public in September 2011 (84% of all users in the corpus). There are more than 8,5 million followee links, with an average of 336 followees per user and a median of 162 followees. The total number of unique followees is almost 1,7 million. Ranking the followees based on the number of relations inside this #ABC_city community serves as an indicator of the attention that this community as a whole pays to other Twitter users. We inspected the top 100 accounts to understand the nature of their popularity. 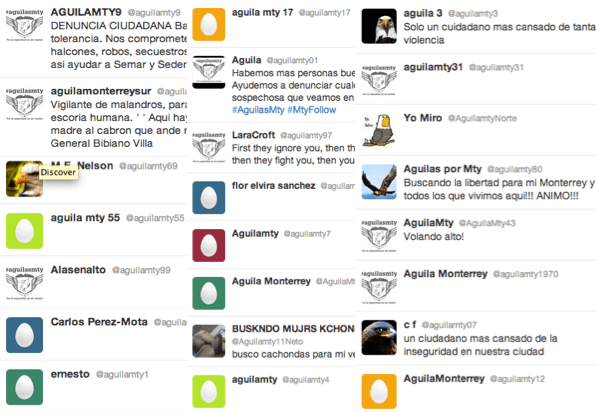 The top account was Mexico’s president, Felipe Calderon, followed by the TV news program of the city, and an anonymous citizen reporter to whom we will refer as @GodFather. Four journalists, the city’s newspaper, a famous Mexican poet, and a comic’s character made up the rest of top ten. Almost half of the accounts in the top 100 are entertainers of Mexican fame, with only a few international superstars such as Shakira or Lady Gaga in the mix. This statistic confirms the widespread perception that a large part of the Twitter appeal derives from its use by celebrities, though it also indicates that each community is interested in its own celebrities. 25 of top 100 most followed accounts belong to local and national journalists and media organizations, compared to 10 for politicians at the state and federal level. In fact, the governor of the state in which ABC city is located (Mexico is a federation of 31 states) ranks at the 45th position in the followees list, one place behind the account of Barack Obama. To understand the appeal to the community of the top 100 ranked accounts, we inspected their Twitter profiles. The top account, @GodFather, has 9,079 followers inside the community, or 36% of all active members. This amounts to 16% of all his audience, he has in total 57,127 followers. @GodFather is an anonymous citizen who has written the largest number of tweets in the corpus (6,675), which make up 25% of all his statuses (26,340). A mutual-follow relation in Twitter (the friendship) is significant because it enables the involved accounts to send direct messages to one another. Direct messages offer some privacy to users, though if an account is hacked messages are compromised (unless a user has the habit of deleting them). Communication through direct messages is not visible to researchers or the public and cannot be quantified. However, it is possible to quantify the extent to which such strong ties exist inside the community by discovering mutual links in the sets of followers and followees. As shown below, on average, 40% of user relations are reciprocated. 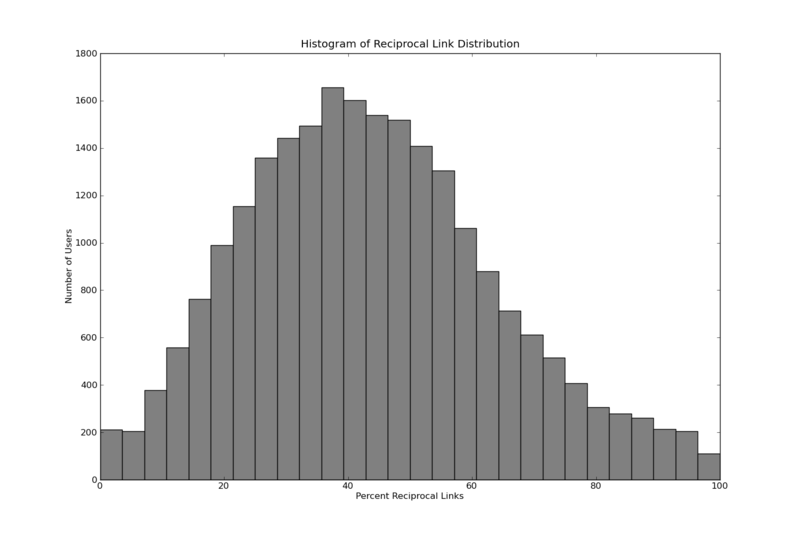 The normal-like histogram of reciprocal link distribution of friendship relations (mutual links) in the network of the #ABC_city corpus. The graph of all members with more than 75 friendship links. 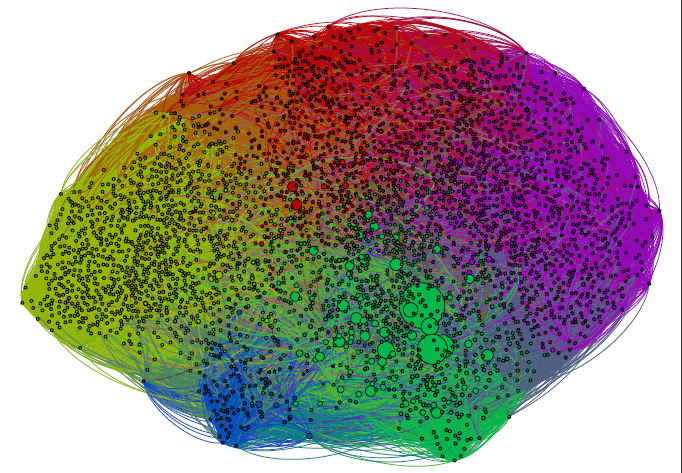 Coloring is produced automatically by the Gephi modularity algorithm that finds communities in a network using the Louvain algorithm. Past research has shown that retweeting is indicative of agreement between the original sender and the retweeter (e.g., (Metaxas and Mustafaraj 2010; Conover et al. 2011)). Over time, retweets are effectively providing information about a community of social media users that are in agreement on specific issues. Otherwise, the chance of a community member retweeting a message of an opposing political community is under 5%. Since retweets involve a relation between two users, the original sender and the retweeting user, we can create a network of such relations for all retweets in the corpus. 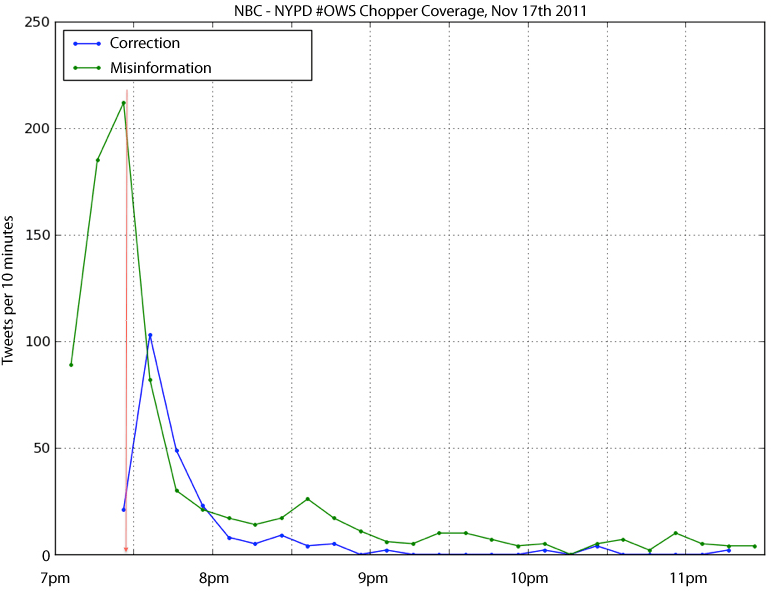 This retweet graph is shown below. 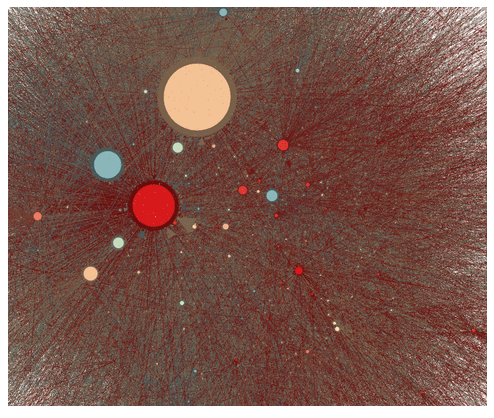 The retweet graph reveals a large component that is actively involved in retweeting, with smaller star-like components at the fringes. Closer examination reveals that the stars at the fringes were occasional retweeters of famous users (e.g., entertainers) and could easily be identified and excluded from our analysis. The nodes have been drawn in size relative to their in-degree, that is to the degree that their messages had been retweeted, revealing a small number of accounts that rose to prominence in the community. Zooming in inside this graph reveals the most influential nodes in the community, which we identified as the anonymous citizen reporters. The biggest node belongs to @GodFather. 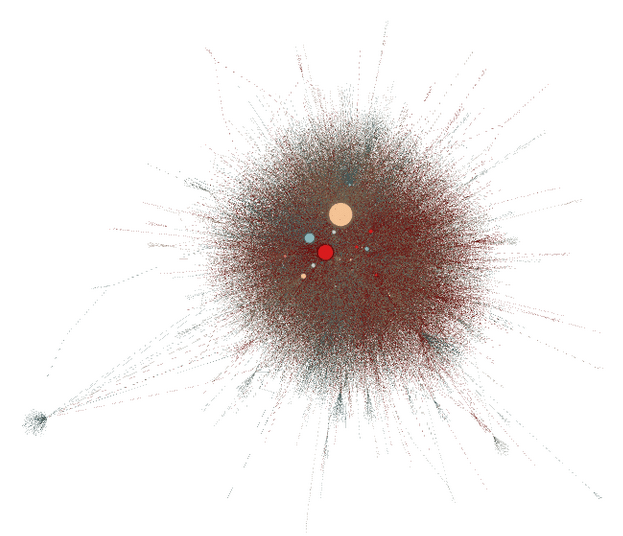 A closer look at the core of the community reveals 13 nodes that have a larger share of their messages retweeted. The spatial proximity of these nodes determined by a force-directed algorithm indicates that they were also retweeting each other (as opposed to the nodes in the periphery of the retweet graph). The biggest node belongs to @GodFather. Tweeting activity of three groups of users with different tweeting patterns overlaid with the frequency of appearance for the word “balacera” (shooting). All three groups have an increase in activity, matching the ups of the balacera distribution. There is only one discrepancy, in April-May 2011, related to an event explained in the next section. 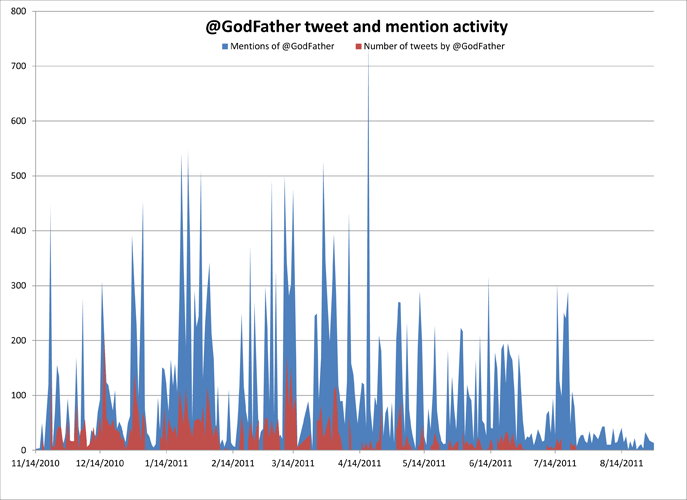 Daily distribution of tweets for the anonymous account @GodFather and its daily mentions in tweets by other members of the community. In April 2010, he was accused by newly created anonymous accounts of working for the criminal organization. 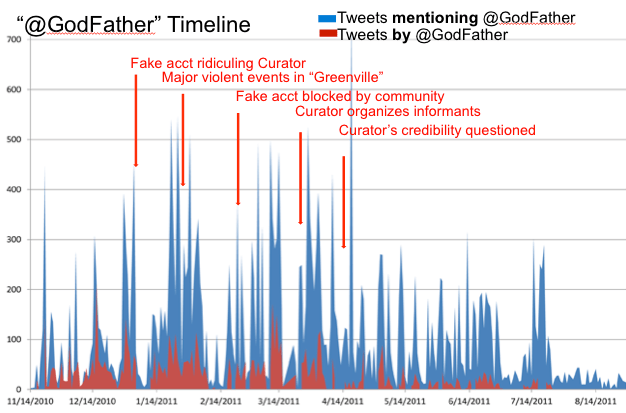 After that event, he decreased his involvement in the community and at the end of July stopped tweeting altogether. WHAT DOES IT MEAN TO BE ANONYMOUS IN A DANGEROUS ENVIRONMENT? In a time when social networking platforms such as Facebook and Google+ are pushing to force users to assume their real-life identities in the Web, we think that it is important to provide examples of communities of citizens for which maintaining their anonymity inside such networks is essential. But being anonymous makes one more susceptible to denigration attacks from other anonymous accounts, leaving the other members of community in the dilemma of who to trust. Inside a community, even anonymous individuals can establish recognizable identities that they can sustain over time. Such anonymous individuals can become trustworthy if their efforts to serve the interests of the community remain constant over time. The next step in the evolution of Social Computing Research: Formal acceptance of credit worthiness by the community of Replication, Verification, and Availability of Big Data. In his response to my posting on Research Replication in Social Computing, Dr. Bernardo Huberman pointed to his letter to Nature on a related issue: Verification of results. Here I expand to include proposal that I have heard others mention recently. Let me add something further, that I heard it mentioned by Noshir Contractor and Steffen Staab at the WebScience Track during the WWW2012 conference, that I think will complement the overall proposal: People who make their data available to others should get credit for that. After all, in Science a lot of time is spend collecting and cleaning data, and whose who do that and make their data available to other researchers for verification, meta-analyses and studying of other research questions should be rewarded for their contributions. I believe the time is right to introduce formal credit for replication of results on comparable data sets, verification on the same data set, and for making data accessible to others for further and meta-analysis. I plan to use much of my group’s research time on these issues this summer and publish our findings afterwards. There are not too many results that Social Media research has discovered in the last few years that are as accurately reproducible as the title of this blog: Political RTs do mean endorsement. I have written a few things about the related research in my “Three Social Theorems” blog post a few weeks ago (this being the first theorem), and it was the theme of my talk during the “Truthiness in Digital Media” symposium at the Berkman Center. This does not mean that every political RT is an endorsement. (If that were the case I could break it with a retweet right now). But it means that, when people retweet, that is, when they broadcast unedited to their own followers a tweet they received, most of the time they have read it, and thought that it is worth spreading. They practically endorse it. […] it left news organizations facing a new round of questions about accountability and standards in the fast and loose “retweets do not imply endorsement” ethos of today’s political journalism. Interestingly, it is mainly a few journalists that feel the need to explicitly mention in their personal profile description a disclaimer to the effect “My Retweets do not mean agreement”. In fact, out of more than 83,000 profile descriptions that my colleague Prof. Eni Mustafaraj and I have in our database of election-related tweets, we found only 53 that mention this disclaimer. 31 of them belong to journalists. Should we expect more such lies to race across social media in the remaining months before the elections? Probably yes. Should we expect journalists to be much more cautious the next time they retweet something from a source they do not trust? Certainly yes. But the good news is that, lies, in general, have shorter, more questioned lives in Social Media. See Social Theorem 2 for the supporting research in this one. Does it mean that no lie will ever be spread? Of course not. But it means that most of the time they will be caught, especially as more people are aware of the RT Theorem and care about the truth. Do all people care about the truth? Of course not. Take for example, Mr. Smith, the originator of the false blog post. Recently, I attended a couple of talks on conducting social experiments. I found them both very interesting for different reasons, and thought of giving you an overview in this posting. Michael is interested in exploring how well would people be able to effectively crowd source in the lab, when presented with a variety of problems, from the computationally easy to the hard. Graph coloring is a hard problem for a computer (i.e., for any parallel or sequential algorithm we know so far). How well would 36 undergraduate students solve instances of graph coloring? Quite well, it turns out. See the video clip. Finding consensus (e.g., having all nodes in a graph choose the same color) is an easy problem to solve by both sequential and parallel algorithms. Yet, when presented with a time limit, humans have troubles reaching consensus as they are not able to come up consistently with a successful strategy: some will change colors often, trying to accommodate their neighbors; others will stick stubbornly to their color expecting other to follow them, yet others will flip-flop a lot giving up at the wrong moment, etc. Experience does not seem to help: Playing this game over and over, seems to be teaching them little. See this video clip of 36 undergraduates finding consensus of a graph composed of highly interconnected tribes. The two video clips I recorded on my iPad during his talk are only a small teaser of the work Michael Kearns presented. If you are interested, you should take a closer look at his published papers. Jerome and his colleagues at the University of Paris tried to re-create online as close as possible the environment of the labs that social scientists have used for a long time. They recruited subjects from the very same pool, and asked some of them to participate in experiments in a lab setting, while others were to participate in the very same experiments online. There were no interactions between the participants, though the ones in the lab would see who else had come for the experiments. What they found was that the results of the experiments differ! In particular they found that the online subjects seem to be significantly more social than those in the Lab: More altruistic, showing higher trust, and being less risk averse. While this is still preliminary work, it seems quite promising in giving us a better understanding on the transformation we undergo when we go online. You can watch the full talk of Jerome Hergueux from the Berkman’s site. We still have a lot to learn about conducting social experiments, but these two talks are definitely helping in this direction.